Public Vigil: Bishop Zurek says Priests for Life has no "ecclesial status"
Can a fig tree, my brethren, yield olives, or a grapevine figs? No more can salt water yield fresh. Who is wise and understanding among you? By his good life let him show his works in the meekness of wisdom. But if you have bitter jealousy and selfish ambition in your hearts, do not boast and be false to the truth. I think this letter from Bishop Zurek on January 24, 2011 to the US bishops is explosive proof of his fundamental ideological opposition to the mission of Priests for Life. If the things he states in this letter are true than Priest for Life should never have been allowed to come into existence. So how is it that this organization with "no written decree from any competent ecclesiastical authority anywhere" has 21 bishops and cardinals on its Advisory Board? Bishop Zurek also brings up Missionaries for the Gospel of Life in his letter. I don't think there is any dispute that this attempt at creating a religious order that would be entirely devoted to pro-Life work had to be abandoned by Father Frank Pavone. That is very unfortunate. If this organization were alive today, we would not be witnessing this current controversy which has already done so much harm to the pro-Life cause. I wonder... Why wasn't this earlier letter revealed to the press? 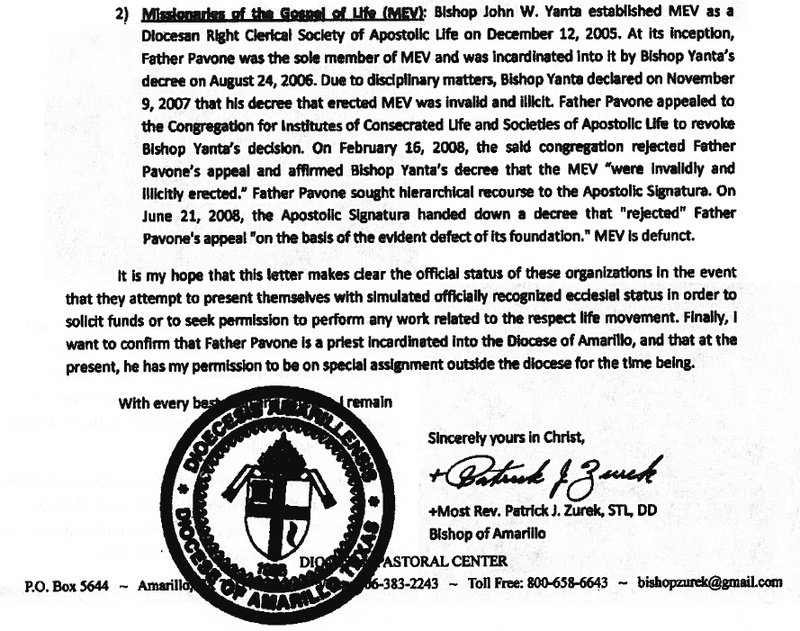 I happened upon this document buried inside a pdf on the website of the Diocese of Las Cruces, New Mexico in a Google search. I have searched for a copy on the USCCB website, but have not been able to find one. 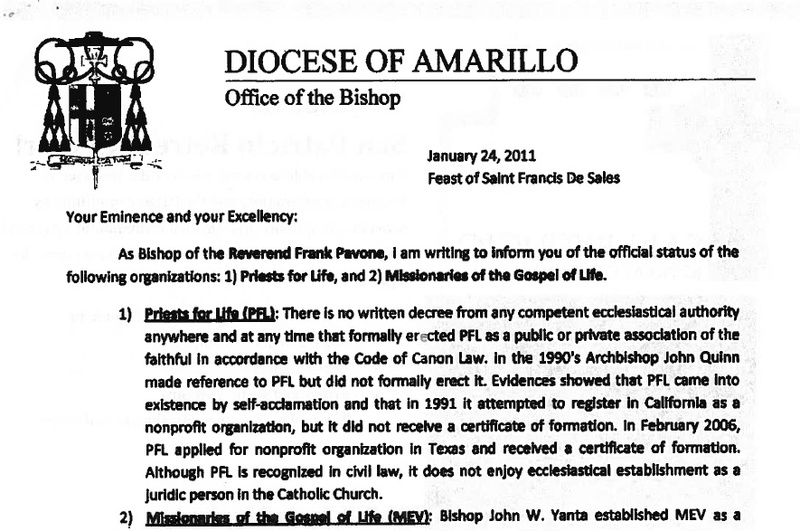 Since the Bishop of Las Cruces received this letter, I assume that the rest of the bishops also received and read it. And that would include the US bishops that are part of the Priests for Life Advisory Board. And that would also include Bishop Baker of the Diocese of Birmingham, Alabama where EWTN is located. 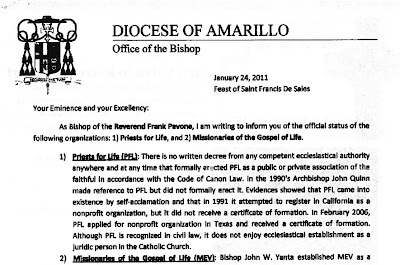 It is my hope that this letter makes clear the official status of these organizations in the event that they attempt to present themselves with simulated officially recognized ecclesial status in order to solicit funds or to seek permission to perform any work related to the respect life movement. 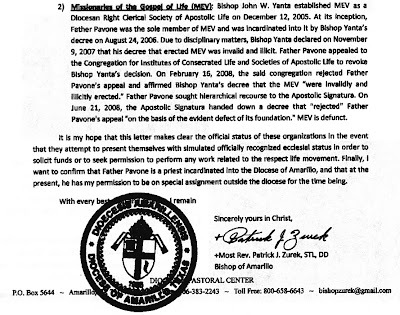 Finally, I want to confirm that Father Frank Pavone is a priest incardinated into the Dioceses of Amarillo, and that at the present, he has my permission to be on special assignment outside the dioceses for the time being. What a strange and perplexing statement. Ambiguous would be way to generous a description of this cryptic paragraph. The bishop says that Father Frank can continue his "special assignment", but that apparently he shouldn't do any "respect life movement" work. When you figure out what Bishop Zurek is saying here, let me know. NOTE: This information was posted previously as "UPDATE 7" at the previous article titled, "In full support of Father Frank Pavone". I'm reposting it here to give it the prominence that it deserves. 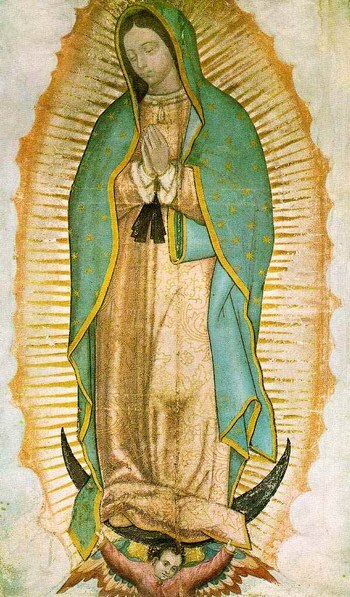 Our Lady of Guadalupe, protector of the unborn, pray for us.